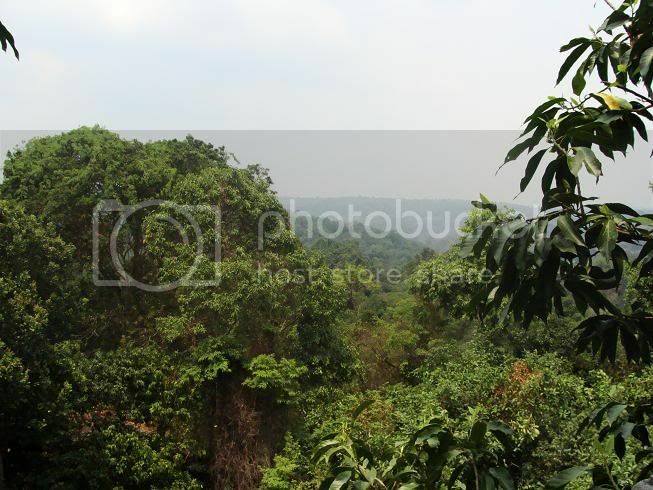 Getting to Phnom Kulen is a bit of an adventure in itself. While not necessarily off-roading, there was about ten miles of dirt road, recently grated, that went from two lanes to a single lane pretty rapidly. In the rainy reason, however, parts of the road would be impassable to a vehicle without a high axle and four-wheel drive. In the rainy season, you should check the road conditions before starting out. Tuk-tuks cannot make the trip as some of the ascent is quite steep, so you will likely have to hire a car in order to go here unless you have a dirt bike. It is beautiful. It is in the mountains, and like so many places in Asia there is a mysteriousness to the mountains. In Southeast Asia, they are where people who don't cultivate wet rice dwell, this being a major civilization divide through insular and mainland Southeast Asia alike. Phnom Kulen is where the Angkorian era “officially” began, with Jayavarman II initiated the cult of the king, a linga cult, in what is dated as 804 CE and declaring his independence from Java of whom the Khmer had been a vassalage state (whether this is actually "Java" or "Lava" (a Lao kingdom) is debated, as well as the legend that he was earlier held as a ransom of the kingdom in Java. See Higham's The Civilization of Angkor for more information about the debate). An inscription from the Sdok Kak Thom temple recounts that on the top of the Kulen Hills, Jayavarman instructed a Brahman priest named Hiranhadama to conduct a religious ritual known as the cult of the devajara (Khmer: ទេវរាជា) which placed him as a chakravartin, universal monarch. The cult established him as the supreme ruler of the land, and therefore he succeeded in unifying the country. But Hindu civilization had existed already for centuries in the region; the fact that Jayavarman was the second monarch to carry that name was an indication that there had been a powerful king of an earlier epoch. This is also near the river head of the Siem Reap River. In the bedrock of the river are carved hundreds of linga images. There are also some minor ruins. It was not long after the declaration of independence that Jayavarman moved his capitol, not yet to Angkor but to what is known today as the Rolous Group, among the oldest temples with the Angkor area. 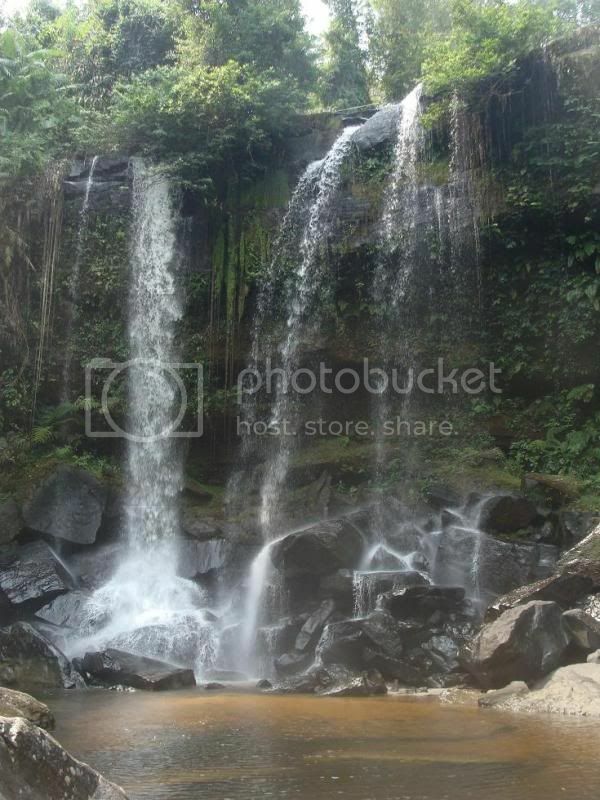 Phnom Kulen is also a national park, and it houses a few very impressive waterfalls. On the weekends, it is very popular with Cambodians. However, if you'd like the place to yourself for at least a little while, try arriving by 9:00AM on a weekday. It is about 55 KM from Siem Reap, and the trip takes anywhere from an hour to ninety minutes. By 11:00AM on our last visit a few Cambodian holiday-makers showed up, and by noon foreign tourists began to pour in also. Also, be sure to view the carving of Vishnu in the river bedrock above the first falls, with Lakshmi as his feet and Brahma seated on a lotus growing from his navel. We spent most of the morning at the waterfalls as outside of these wonders there is little to see. There are several Khmer eateries (as well as a few souvenir stands) that serve typical Khmer dishes. And the flocks of chicken running around the area are also available for your plate. The ruins, while not particularly impressive in terms of structures are in terms of age—they are among the oldest Khmer ruins in the Siem Reap area, and no real restoration work has happened. Seeing the rubble makes one appreciate what a difficult job just re-visioning the temple would be. After having a lunch (or without), one can go for a swim at the bottom or the very impressive Kulen waterfall. Stay on the trial. 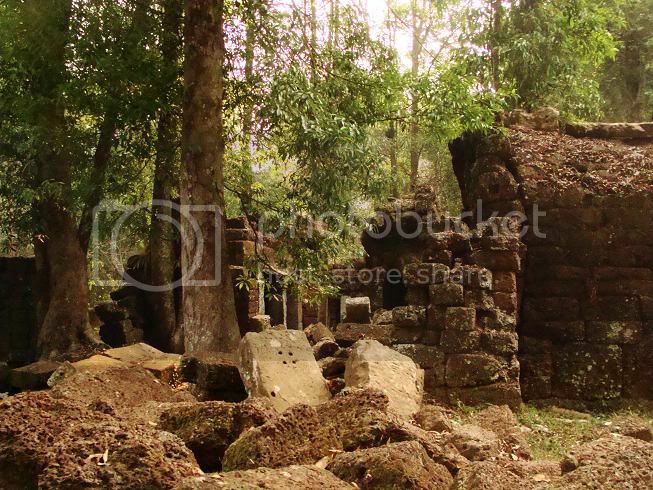 While not known to be a mined area, parts of Kulen are undergoing de-mining. As elsewhere in Cambodia, stay on well-trod trails. After the waterfalls, you can visit a very active temple, Preah Ang Thom, that has a 16 meter long reclining Buddha carved on the top of a huge bolder—maybe itself 20 meters tall. The carving dates to the 16th century. 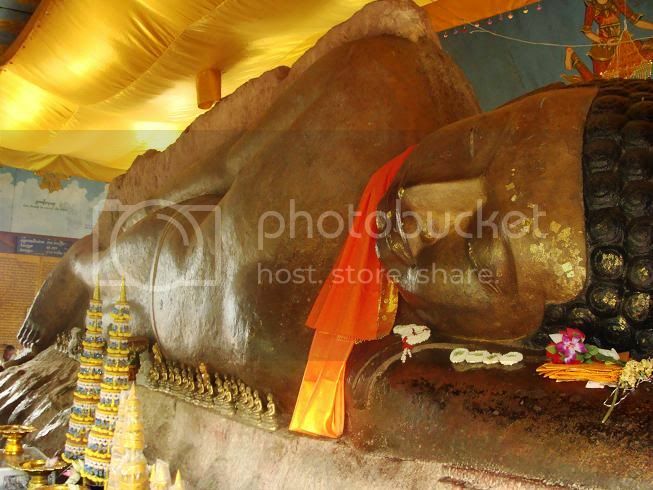 This is the largest reclining Buddha in the country. On the way, you can also stop and quickly view the "1000 Lingas" also carved in the river above the waterfalls. There were about 100 steps climbing the hill to the pagoda and carving, and the first 75 were lined with beggars, mostly children and old women. There are a few money changers at the bottom so that you can get small change to pass out as you make the walk up, handing out between 100 riel notes and 500 reil bundles to the beggars. And at the bottom and top you can have an incantation recited for you over the loudspeakers for just $1—for luck, they say. This is carved into the top of about a 20 meter tall boulder. It can be a long trip, so set aside at least a half day in order to visit.